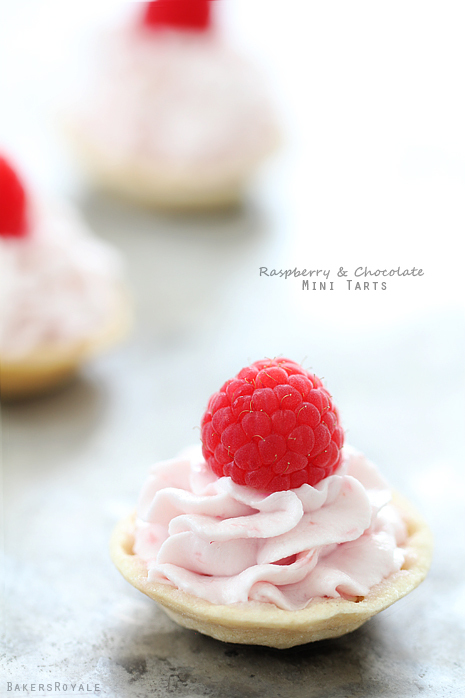 How adorable are these tiny tarts? I think dainty desserts are just the sweetest thing. 1. Place raspberries, cassis and grenadine in a food processor and pulse until pureed. Set aside 5 tablespoons of mixture. 2. Place cold cream and sift confectioner over the top it, using a hand mixer beat on high until medium peaks form. Be careful not to overbeat or it will look broken and curdled like. Turn off hand mixer and fold in remaining raspberry mixture. 3. Coat bottom of tart shell with melted chocolate and then set aside until chocolate hardens or place in the freezer to quickly harden it. Place about 1/4 teaspoon of reserved raspberries on top of chocolate. 4. Fit pastry bag with preferred tip and pipe raspberry mouse on top. Keep refrigerated until 20 minutes before serving.